Internet Explorer is a deadly creation, conjured up by the madman Bill Gates. It looks innocent and friendly on the outside, but is really a insane murdering "E" that, in the night, jumps out of your computer and goes on massive rampages through your town. 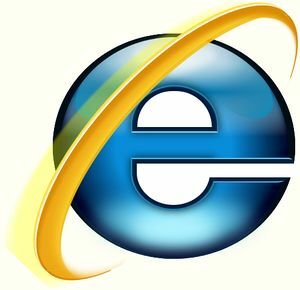 Luckily, there is hope for people, because we have Mozilla, an enormous dinosaur thing, who fights every night with this "Internet Explorer" to keep us safe. Mozilla usually wins every time. He also has a few companions, Firefox, some other one, another one, and this one I can't remember. We are lucky we have Mozilla to fight this monstrous E. Without Mozilla, Internet Explorer and Mac Computers would rule all humans, and we would be their slaves! So let's be thankful that we have Mozilla and Google, okay? This page was last edited on 12 Octodest 2013, at 05:25.